A docu-musical about the forgotten side of the California coastline. 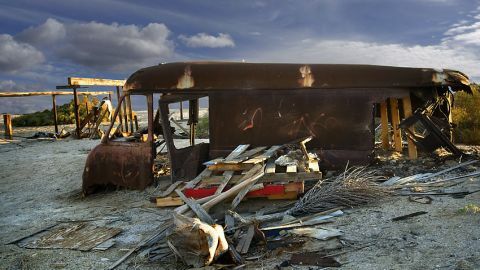 Washed up on the shores of a man-made sea in the middle of the desert, Southern California’s refugees live among crumbling buildings and burned-out cars. Filmmaker Alma Har’el’s hybrid docu-musical project is a social portrait daubed with surreal interludes of dance. Scored by electro-folk troupe Beirut, Har’el’s camera waltzes around Slab City’s sad, eccentric characters in a fever dream caught somewhere between Terrence Malick and Terry Gilliam. Quirky, moving and unique, it’s a haunting bedside view of the place the American Dream went to die.